Childhood obesity invites a domino effect of high risk, life threatening diseases. Read the facts below. Overweight and obese children have an increased risk for breast, colon, endometrium, esophagus, kidney, pancreas, gall bladder, thyroid, ovary, cervix and prostate cancers. Including multiple myeloma and Hodgkins lymphoma. Seventy-five percent (75%) of children who are overweight at the age of 18 remain overweight for LIFE! Numerous respected studies suggest the current generation's life span will be shorter than their parents. Poor food choices. Poor quality of food. Reduced physical activity, school, family, media, fast food, social demands and environmental influences all play a role in the diminished health of children. All play a role and contribute to the childhood obesity epidemic. Parents must take an activist role in helping their child lose weight and improve health. Sixty-nine percent (69%) of overweight children have at least one overweight or obese parent. Dieting behaviors and preferences are learned at an early age. Obesity, and the eating and physical habits causing it, are primarily learned behaviors. All avoidable. All unnecessary. Young people are the most hypnotizable of any age group because they posses an active imagination and are open to change. Their poor habits have not yet been ingrained in daily behavior for 25-30 years or more. This fact presents an excellent opportunity for your child to lose weight, improve eating habits and increase physical activity. Parental participation is mandatory to realize a real and lasting weight loss result. Let's be frank. If you don't protect your child from obesity, WHO WILL? Restaurants, schools, our government, have failed in their responsibilities to protect the health and welfare of our children. Parents must accept this inevitable responsibility. Inspire Hypnosis can assist you in fulfilling that responsibility. We love working with young people and their families in pursuit of a healthier lifestyle free from the dangers of obesity. Don't wait. Don't put it off. 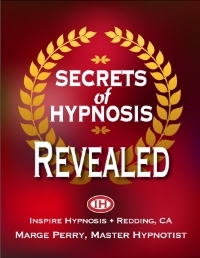 Call (530) 387-6644 for a free hypnotic screening for you and your child. Everything will be explained in detail. The screening takes about 30 minutes. It's fun, informative and the first step to you and your child being the exact weight, shape and size of your dreams. Call now, while you're thinking about it. Yes, it's that important. "The rise of childhood obesity has placed the health of an entire generation at risk." "One out of five Illinois children are considered obese. Not overweight, obese. And two-thirds of Americans are either overweight or obese." "It is said that the way to prevent obesity is not to allow kids to become overweight in the first place. But it takes a multi pronged approach that has to start with parents. Kids are just too young to understand the consequences of obesity." "If the childhood obesity epidemic remains unchecked, it will condemn many of our kids to shorter lives, as well as the emotional and financial burdens of poor health." "In our fast-forward culture, we have lost the art of eating well. Food is often little more than fuel to pour down the hatch while doing other stuff - surfing the Web, driving, walking along the street. Dining al desko is now the norm in many workplaces. All of this speed takes a toll. Obesity, eating disorders and poor nutrition are rife." "We struggle with eating healthily, obesity, and access to good nutrition for everyone. But we have a great opportunity to get on the right side of this battle by beginning to think differently about the way that we eat and the way that we approach food." "Getting kids moving is a key factor in tackling obesity and health problems among the young." "I don't know too many parents that want to feed their kids soda, but high-fructose corn syrup is cheap. The price of soda in 20 years has gone down 40 percent while the price of whole foods, fruits and vegetables, has gone up 40 percent and obesity goes up right along that curve."